I'm going to shoot straight with you, my darling dears; I am eagerly anticipating my beloved Guillermo del Toro's Crimson Peak. For most of the year it has been on the top of my Must See Or I Will Die List because everything about it appeals to me. The Gothic Romance setting, the focus on an intelligent and inquisitive female character, a haunted mansion with unspeakable yet delicious forbidden mysteries and a huge appreciation for the literature that inspired it. So, grab your dusty anthologies of Poe, Byron and Shelley, turn off the lights, ignite some candles and allow me to indulge you with the anticipation I have for this film. Mia Wasikowska. Tom Hiddleston. Jessica Chastain. 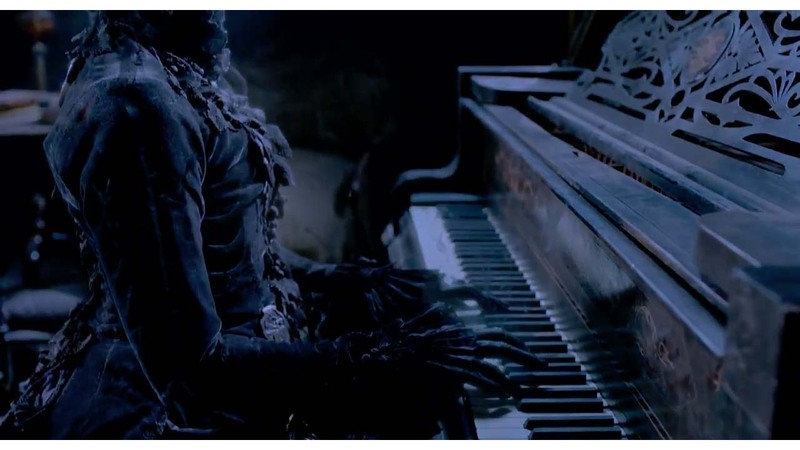 Doug Jones. Not so much Charlie Hunnam but four out of five ain't bad. You see, when it comes to period-based films, there are some actors that look like they were born in that era. Humphrey Bogart and Lauren Bacall looked like they hailed from the dirty, scandalous and seedy climes of film noir, Jason Statham appears like he belongs on the mean streets of the London criminal underworld and E.T looked like he hailed from a toilet bowl. Chastain, Hiddleston and Wasikowska seem as if they have stepped right out of the Victorian era because of their features and the way they hold themselves. It's not an easy thing to to appear as if you come from a time which the bicycle, typewriter and gaslight were the apex of human ingenuity and there is only so much a wonderful wardrobe and make up scheme can do for one's face and body. 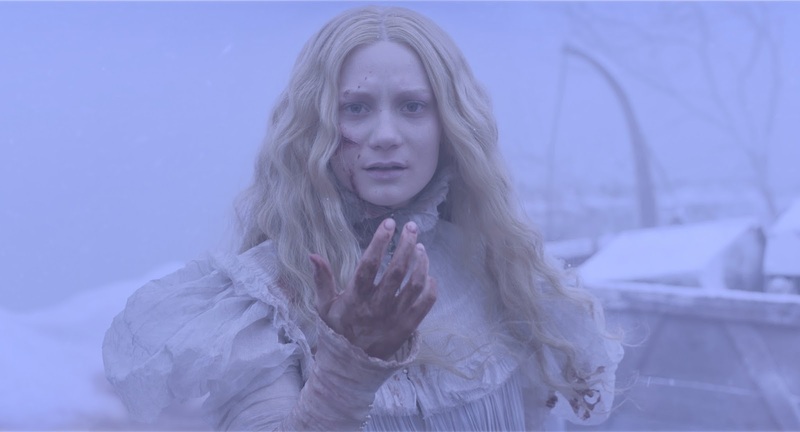 Wasikowska has an ethereal look to her that reminds me of the white-clad waifs of Poe, the tubercular beauty who forlornly straddles the realms of life and death, however with del Toro's self-proclaimed subversion of the genre, Wasikowska's Edith Cushing (points if you get the reference of the latter part of her moniker) looks to be more than a mere sum of her parts. Jessica Chastain (Lady Lucille Sharpe) too possesses that same other-worldly appearance that defies a mortal woman who walks the plains of this earth. Lucille's chilly yet genial demeanor and matching disposition is straight out of the Gothic Romance handbook- this lady is hiding something and it's something big. Meanwhile, as for Tom Hiddleston (Thomas Sharpe), well... the man do can more than snark and sneer as the Norse god of mischief, but just like Chastain, he has the look of a man who is harboring a terrible enigma under his proper exterior. Also, given his and Chastain's characters are meant to be brother and sister, I can actually see a resemblance. Doug Jones can play anything- he could totally play Captain Marvel... well maybe that was going a little too far, but a film that once again combines the creative punch of del Toro and Jones is going to be a cracker. Note: Benedict Cumberbatch and Emma Stone were originally slated to fill in the roles of Wasikowska and Hiddleston and I'm thankful both bowed out because while Cumberbatch could theoretically fit the role of Thomas Sharpe, Stone is very contemporary. Don't get me wrong, I love both and I'm not casting shade to either, but there are some things that are just meant to be and I'm relieved at the final product. A) not a comic book movie where there is a definitive source material. B) Not a Nicholas Sparks or Nicholas Sparks clone where white people hold each other's faces and kiss a lot and somebody dies and boo-hoo. C) It's not a sequel. Crimson Peak seems intent to abide by its own rules and whatever moves it makes across the chessboard comes from it's own self-contained mythos and lore. 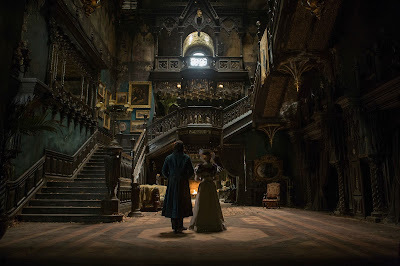 The archetypes are there, but there has been countless and provocative stirrings from the cast and crew of Crimson Peak that says that while the setting is a loving reference, the particulars of this story are not... isn't that lovely? 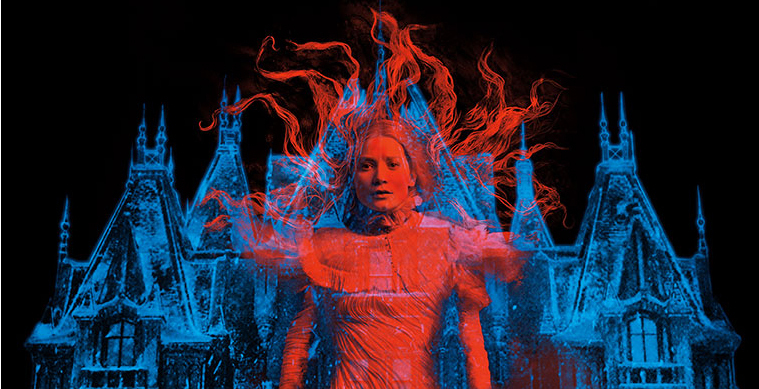 I can't tell you how reassuring it is to hear from varied sources (Here, here and right here) that the women of Crimson Peak will be given agency. Gothic fiction isn't always kind to female characters, be they benevolent or otherwise and often times, when it comes to tragic and horrible demises, the femmes tend to meet the worst fatalities. Wasikowska, Chastain, Hiddelston and del Toro have gone on the record to assure today's audiences that Edith and Lucille will not be mere plot devices but instead be living firmly in their own existence. Taking into account Edith is the lead protagonist of the story, this will undoubtedly serve not only the story at large but her as a character. Most of del Toro's female dramatis personae in the past have always had an innate strength and empowerment within them. They are not flawless beings by any stretch of the imagination, but they have depth and motivations for their actions and del Toro doesn't use them as glorified window dressing and they are both reactive and proactive, meaning while they may respond to outward developments of the story that affects them, they aren't content to sit back and do nothing. Women's representation in horror is a mixed bag, broadly speaking, not all of it is undesirable and it is all a matter of context, but there are regrettably some infuriatingly antiquated examples still being set loose on the genre even today. I don't like getting up on a soapbox too much, but as I am making a point in regards to a prevalent aspect of this film, I wanted to take the opportunity to share my thoughts. Make of those as you will. While the trailers have hardly been overwhelmingly subtle and even incredibly obvious, there still remains a sense of mystery to what the actual story is. What we see and what we speculate can only fulfill so much of any preconceived notions we may have about the movie until we actually see it. That being said, the plethora of visuals on show here are utterly handsome and splendid that they give you an impression of being in a luxurious contemporary vision of fantasy mixed in with reality. The menacing yet elegant interior of Thomas and Lucille's domicile is a combination of darkly opulent and insectoid, a gateway to another dimension in a world that is otherwise dominated by industry and the humanities of the 18th century. And then there is that basement we saw several times in the trailers which look like what would happen if you were an alien who confused a sauna with an abattoir. Yummy. Additionally, may I just say, given this story has highly Gothic sensibilities, I expect some of the more deliberate tropes will not just be regaled to the appearance, but the actions and the motivations that fuel the characters. I mean, I can't be the only one who got a disturbing inbred nobility vibe from the Sharpe siblings, can I? If I had to quantify how many English-speaking films successfully fill the bill of what makes an effective and chilling spectral story I can only count on one hand. Okay, that is a slight exaggeration on my part, but when you compare tales regarding the beyond that don't involve demons, werewolves, vampires, mutants and aliens, ghosts unfortunately don't get the caring attention I feel they deserve. Now, just to clarify, there are many films around the globe which have a respectable pantheon of this sub genre, namely Eastern horror, but I think it's about time Hollywood-styled blockbusters have a good bash at delivering us a movie about our wraithy compatriots. Goodness knows it's lovely to take a break from sparkles. Take note, Hollywood. Those who dig men don't want 50 Shades Of Sexually Uncreative Impotence, they want Crimson Peak. Is it October 15th yet?